In preparing for my trip to the Netherlands, I discovered an exciting new book on Dom Hans van der Laan whose author will speak at the conference at de Tiltenberg. It is entitled Mystery and Matter: On the relationship between liturgy and architecture in the thought of dom Hans van der Laan OSB (1904‐1991) by Michael Remery and published by Brill. Though I am only now half-way through, I can say that it is a highly commendable work of scholarship on many levels. It contains very clear and well-written summaries of Hans can der Laan's theories on liturgy, on proportion, and on architecture; more importantly it attempts more than any other work–and more than is explicitly clear from reading van der Laan's primary published texts, which he intentionally kept distinct–the integration of the various components. But it also fills a number of voids in the scholarship on van der Laan. The first is a biography; no biography of van der Laan exists, comprehensive or otherwise, so the first chapter is a succinct but thorough account of his life. While more detailed than the primary thesis of the book requires, the fact that no other source exists makes this element alone of great value. The second void filled is the analysis of centrality of the liturgy–in theory and in practice–to the whole of van der Laan's œuvre. This has been lacking from all significant studies of his architecture. In particular Richard Padovan, van der Laan's English translator and a significant champion of his architectural theories, dismissed and down-played the liturgical component of Architectonic Space, suggesting that it was not essential to its development. Part of the thesis of the present work has Remery demonstrating that the entirety of van der Laan's thought developed not in sequential stages (of proportion, space, and liturgy) but as a complete whole based on his Solesmes Benedictine spirituality and liturgy. The subsequent development was a refinement in the precision of his terminology and application. Remery is able to do this by relying on the massive but unordered Archive Van der Laan which includes personal correspondence, lectures, and unpublished manuscripts. The introduction of these elements represents the third void filled by this book. While van der Laan's books are incredibly dense and composed, giving the impression of absolute completion, there are enough drafts and reiterations to show that van der Laan's theories were developed en masse and were substantially complete at a very early date, well before the publication of his first book. "Those who believe that he was referring here to the dolce vita will be disappointed when van der Laan explained that his Roman experience was like fasting during Lent: severe, well-balanced, cheerful, and pithy, elements he attempted to apply when designing the church of the abbey in Vaals in 1956." To me this is a striking insight and a compelling contradictory criteria for a church. It comes not from his architectural theories or his teaching, which rarely if ever addresses the expressive component of architecture other than placing it within the hierarchy of forms. And it echoes with my personal taste in what I appreciate in promising church buildings and what I find lacking in disappointing ones. Such a sound-byte begs to be tweeted, so I posted it in an intentionally more provocative form to see what reaction would follow. The comments on facebook spurred on further reflection (despite the limitations of the medium), so I though it would be worth reposting the thread here with some additional reflections and information. Donna Buras Haskins What about more like Easter? Welcoming, joyful and celebratory? With a whole lot of hope. Donna Buras Haskins I know. I completely agree with you. Lent has Easter hope and joy in its celebration and invitation to follow Christ. Perhaps the building should be invitational and mission like lent but joyful and welcoming like Easter. A central element of Solesmes spirituality, of which I was not aware, is the concept of "the spirit of the Incarnation." Van der Laan uses this phrase, or simply "Incarnation," frequently. Dom Prosper Guéranger and his followers use this word Incarnation in an expanded sense which includes the entire of the work of Christ, including His Passion and Resurrection. In fact van der Laan rarely spoke of the isolated event of Christ's death apart from the entire Incarnation and/or its enacting in the Eucharist. So I do not think it is a stretch to say that van der Laan would have seen Easter as integral to Lent. Still, a choice was made for the attributes of Lent (with Easter) and not Easter (following Lent). I see three reasons for this which inform the remainder of this discussion, and all of which pertain to the monastic vocation. The first involves the temporal use of the church building. Each Sunday is itself a small Easter, so it would follow that a building for the Sunday liturgy might have the qualities of Easter. However, this is a faulty expectation of the function of the church building, especially to the monastic, and it is based on our depraved current practice. The liturgy is continuous, not episodic once a week. Sunday is the high point of a cyclical continuum, not an isolated event. The second follows from the first in its application. A church must be suited to the entirety of the liturgy. Enabling a building to breathe and change with the seasons and feasts is a great unrealized challenge of liturgical architecture, mostly because it involves the architect leaving the building to be "finished" over its entire life by others who may not share the vision of the original genius auteur. We leave the realm of traditional architecture practice and enter that of the sacristan and various committees. But this is the Neo-Platonic model van der Laan describes for creation: that man, created in the image of the Creator, participates in the completion of creation through the application of his intellect to matter and form. As a practical implication, it is far easier to transform an essentially Lenten church into a Paschal atmosphere than to subdue a Paschal church into a Lenten attitude. The third is that the church van der Laan is describing is a monastic church and not a parish church. As such it will have a more disciplined quality and a more severe expression is not out of place.Van der Laan gives indication that his designs are not the sole expression of his theories; they are intended more as the pure expressions, that is, where the architectural implications of the plastic number are the primary experience. Timothy Parker Or is he talking about design as the process, necessarily preparatory, as is lent? As lent prepares the way for Easter, so the act of design prepares the way for the eventual housing of the people of God... and needs the discipline of the process to get it right? Steven Schloeder Good point, Dr Parker. The practice of sacred architecture, if *vocational*, is a spiritual discipline -- perhaps even akin to writing icons since the building itself (in the apostolic traditions) is a sign and symbol of the heavenly realities. One should approach the commission with the utmost seriousness of purpose. The vocation of architecture and design process elements are still the least clear to me, and some of the most promising. It looks like the next major sections will address this in more depth, but it is also an area which merits further study. Jason John Paul Haskins @‎Steven I don't have the source letter, so I don;t know the (probably Dutch) word translated as "severe." I wonder if "sublime" would also server here? Santa Sabina is an example of the church in Rome he named as most in line with his thinking, which may illuminate the terms somewhat. personally, the churches I visit that I find disappointing could all use a bit more severity... but what i find inspiring about this quote, however, is not the single word, but the pairings that are (when attempting to make them incarnate) seemingly contradictory. In fact, looking back at the text it is not clear if these are direct words taken from the letters or a paraphrase or collecting by Remery. Either way, these attributes are more taste and expression than essence, and should not carry the weight of more formal criteria. Remery presents the reference to Santa Sabina in the same paragraph, stating that in it "he recognised the essential proportions that he also tried to incorporate in his own architectural work." What he (van der Laan) responds to here is what he calls "pure architecture," that is, architecture in which what is primarily experienced is the proportion and disposition of the elements themselves. This is in contrast to more "romantic" architecture, based on feelings and intended for effect.Note that this no reason that romantic architecture could not be based on his architectural principles, just that the matter and/or form have greater impact on the human experience. Elsewhere, van der Laan gives an analogous distinction in music between modality and melody which illuminates this matter as well. I asked my wife Becky (my resident musician) for her take. She described the distinction in this way: the more modal music the more it is governed by the physical relationships of the ratios between notes. We hear modal music as more akin to "world music," by which we really mean universal. I think of Orff and Arvo Pärt as potential analogs here. Van der Laan, as a monk of Solesmes, saw Gregorian chant as the ideal. Like modal music, "pure architecture" is pure because it reveals its measures as its primary expression; it is not expressive of anything before itself. 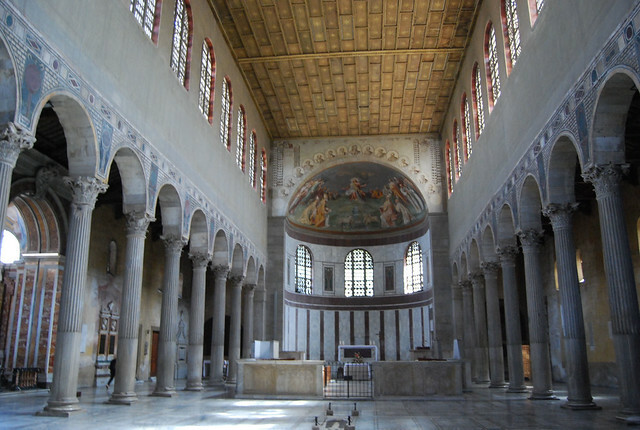 So the example of Santa Sabina is more about an example of "pure architecture" than "severe, well-balanced, cheerful, pithy," though both are certainly applicable. And looking at this basilica in light of van der Laan's theories is more informative than looking only at his own work. Steven Schloeder Thanks, Jason. I could see a way of thinking about the church as a body in the sense of athletically severe -- lean, trim, muscular, efficient, spare, etc. My concern of course is that our modernist materials are already governed by technical efficiency and our esthetic is reductionistic. For the modern, the skeleton is severe not necessarily the enfleshed body. Jason John Paul Haskins ‎@Timothy For his own work, there can absolutely be no doubt. He is one for whom vocation, life, work, theory are completely unified. (compare to Eric Gill...) What I really want to know (and hopefully this book will get into it some) is what he taught. Not all architects are monks, so how did he instruct the process of his students? This gets into the great question of the role of the author in various schools of criticism. I bring it up here because van der Laan presents us with a particularly interesting case of seemingly singular cohesion between life, thought, and work. The comparison with Eric Gill comes to mind because he is an interesting case on the other end where there was a significant disconnect between his life (moral behavior) and thought despite the fact that his thought primarily addressed how we are to behave towards work. His work can be read in light of his life, in light of his thought, or unto itself with three highly contrasting interpretations. I will not here unpack this expansive and promising investigation, but make it even more interesting by reflecting that as the author/scriptor problem approaches liturgical texts, it becomes even more charged. The body analogy is effective. I see two distinct issues here to continue, but not resolve, this observation. First, while skeletal is certainly an expression of severity, is it necessarily its only expression? The example of Santa Sabina, I think, counters this. There is a mathematical/geometric severity in elaborate Baroque San Carlo alle Quattro Fontane. There is a different severity in the contrast of light and dark in the Köln Domkirche. There is severity even in just the scale of the Basilica of St Peter. The second address the notion of severity as previously addressed. Yes this would be fairly universally interpreted as severe, while I would understand that many would question the cheerful and well-balanced attributes (though many would question that Lent is cheerful and well-balanced based on the same assumptions). But the fact that this a monastery church and the fact that it is not intended as a universal expression must be We must also consider that the image in this case is incomplete and therefore "skeletal" in a different sense. Consider: "For Van der Laan it was very important that the church building receives its dignity in the supernatural order not because it is an object of art, but because of the sacramental of its dedication or consecration." (170) Without the remainder of liturgical forms–not just objects, but gestures and words–the building is incomplete. The whole liturgical forms exist not only as external signs (objects), but in space & time (through gestures) and in time (as words), which require the presence and actions of the hierarchy of celebrants in the body of Christ, its head and members. Jason John Paul Haskins another insight on this as it applies to process: vdL's complaint about his architectural training at Delft (until Molière) was that it was "romantic" and expressionist. design was based on "feeling"
Rebecca Marie Fairweather Haskins Fasting during Lent is "severe" because it is disciplined and intentional; it is done because it is necessary and not for show. Sounds like a good rubric for church design to me. Jason John Paul Haskins @‎Steven Your concern is very well-founded and I share it. 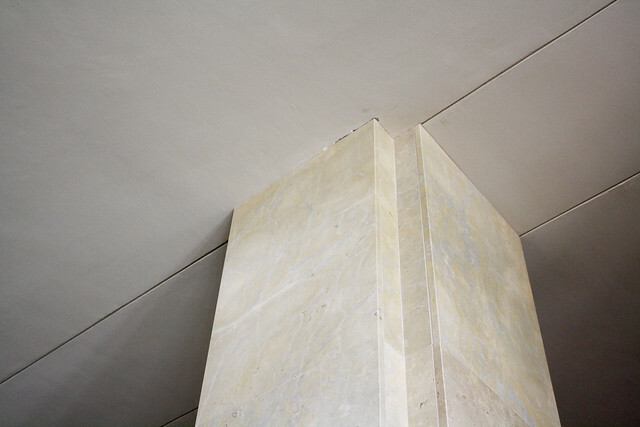 But the faults with modernist materials occur even outside the technical esthetic when something more ornate, rich, or traditional is attempted. And van der Laan's abbey is not part of that modernism. The materials are authentic, if raw. It is not built with modern techniques or materials. I would also argue that it is not redunctionistic even though it is simple. We should also not forget that that photo is missing the celebration with the vestments and vessels (all of which vdL also design as equal parts in the plastic form of the liturgy). Dom Hans van der Laan sought the objective reality of architecture and designed churches to exhibit it as clearly as possible. But the objective reality (truth) of architecture does not consist of or dictate an particular expression (beauty). This follows from can der Laan's observation of his theories as pre-existing in diverse architectures from a range of cultures. It is possible to ignore the principles of this reality, and it is possible to obscure their presence through visual expression. Thus there is no right way to make architecture, but there are certainly wrong ways. Van der Laan's buildings which do not obscure the plastic number in any way can be seen as personal preference. I haven't seen explicit evidence of an acknowledgement that others might need more expressive (and less severe) buildings. But he certainly acknowledged other styles could use/reveal the same principles. I still have many questions regarding the process of implementing the theories, which hopefully the remaining sections of the book will address. Remery's summaries are an excellent companion to van der Laan's dense texts, but it is still an immense system of thought. Perhaps seeing some of the lessons in stone that are his buildings will help clarify the disposition of spaces as it relates to the plastic number. But oh, to be a student in the CKA course!